Confession: I did not make these because I thought they sounded particularly tasty. I don’t mean to be racist, but I don’t like white chocolate. 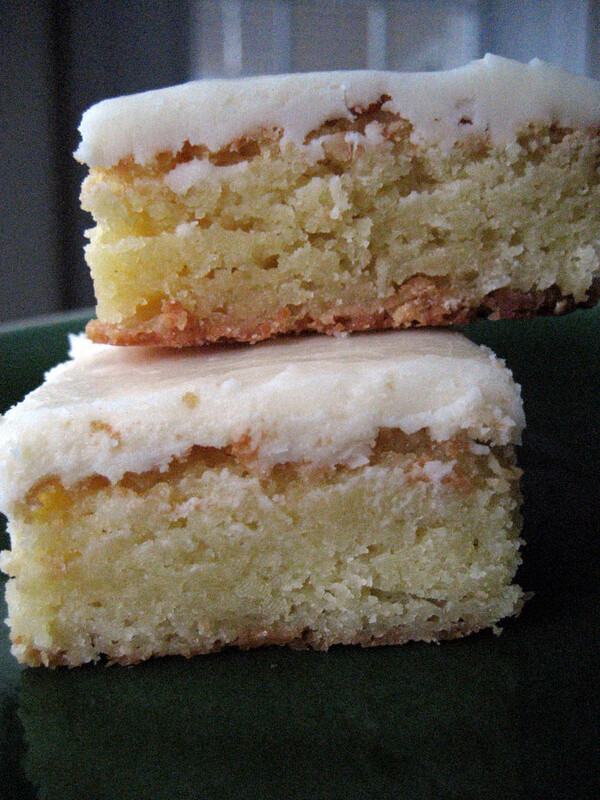 I made these because a wonderful friend requested something white chocolate at the race track and I aim to please. 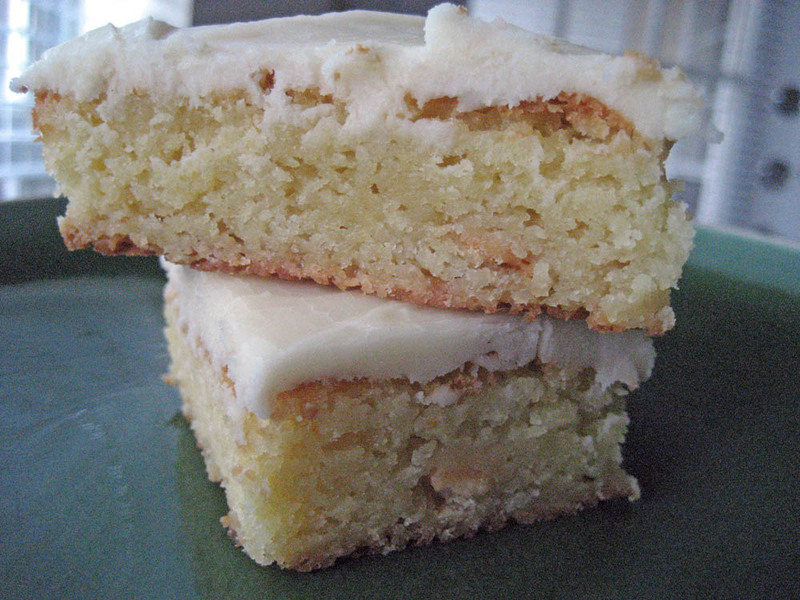 After some searching of the interwebs, this recipe looked like a white chocolate winner I could pull off. Then, something quite fascinating happened at the end of this process… I wanted to eat the entire pan! These are very rich. They’re like a thick, luxurious blondie. 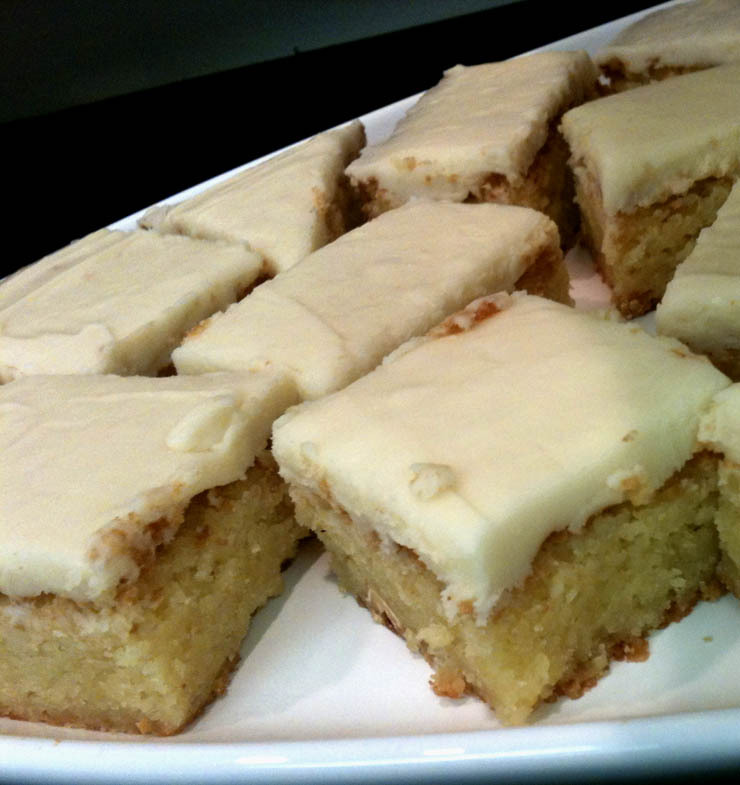 If Macy’s is a blondie, these white chocolate brownies are Nordstrom. The flavor is pure white chocolate and vanilla. The texture is brownie — dense with some crumbs. 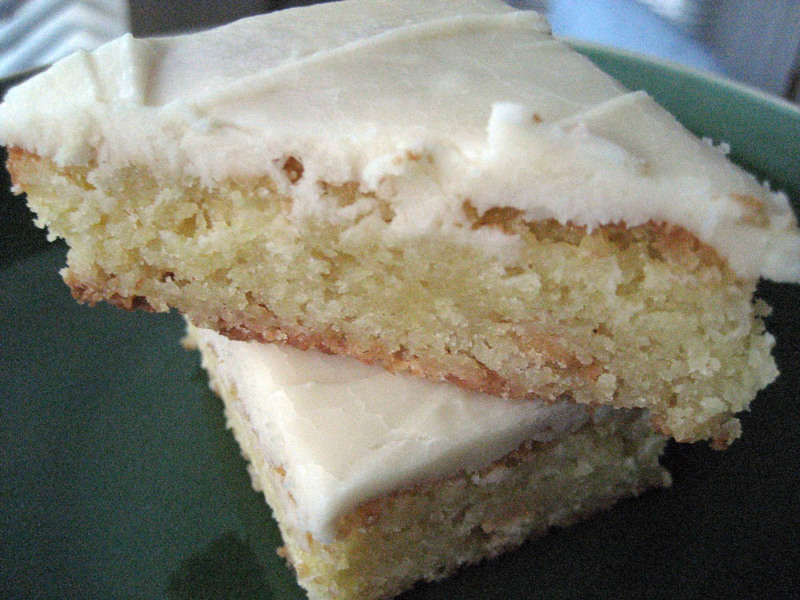 The icing is very thick and sets up nicely. These brownies don’t NEED the icing for flavor or sweetness, but they look better with them because the top of these, unfrosted, isn’t very attractive. Looking over these babies I can’t help but imagine they’d make a great holiday cookie – the smooth white top decorated with red and green sprinkles OR, what if you coated some pretzels in green and red candy melts, crushed them and sprinkled on top!?! I think pretzel would be an amazing flavor match for these. (If you’re lazy or it’s not Christmas, skip that chocolate melt coating part and just put pretzels on top). The directions say you can melt the chocolate in the microwave or double boiler. I go with the double boiler every time. Chocolate burns easy, especially white chocolate. And burnt chocolate is sad… and hot. All you need for a double boiler is to bring a pot of water to a boil and put a heat resistant bowl on top of that with the chocolate etc. in it. (Don’t let the bowl touch the boiling water!) The butter and white chocolate look funny together when melted, they don’t quite mix well, like a vinaigrette that needs to be shaken, but that’s ok.
Make sure your mixture has cooled before you add the eggs – you don’t want scrambled eggs in your brownie batter do you? It’s best practice to add a little bit of the eggs at a time to bring the temperature of the melted chocolate and butter down, while slowly raising temperature of eggs. Also a good idea to start with room temperature eggs. C’mon, jump into the 21st century with me a be a little color blind when it comes to brownies. Preheat oven to 350 degrees. For the brownie part, melt your white chocolate and butter either in the microwave or a double boiler. White chocolate burns easily so be sure and watch it. Melt it in small increments of time if using microwave. Remove chocolate and butter mixture from heat and whisk in eggs and then add in sugar. Mix in vanilla. Add flour. Put into a greased 9 x 13 pan. Bake for 25-30 minutes. Cool and then frost. Melt butter and white chocolate in microwave or double boiler. Remove from heat and add powdered sugar, whipping cream and vanilla. Frost brownies.